Vance Center Director of Pro Bono Partnerships Jorge Escobedo spoke on a panel at the New York City Bar Association on “Stress Testing International Refugee Law”. Organized by the Association’s International Human Rights Committee, among others, as well as the Australian Law Council, the event featured expert legal analysis of current immigration law and policy in the United States, the European Union, and Australia, based on international refugee law. Escobedo highlighted the Vance Center’s “Keep Families Together” initiative, which finds pro bono legal assistance in Latin America for children separated from their families by the U.S. government’s “Zero Tolerance” policy and other immigration measures. 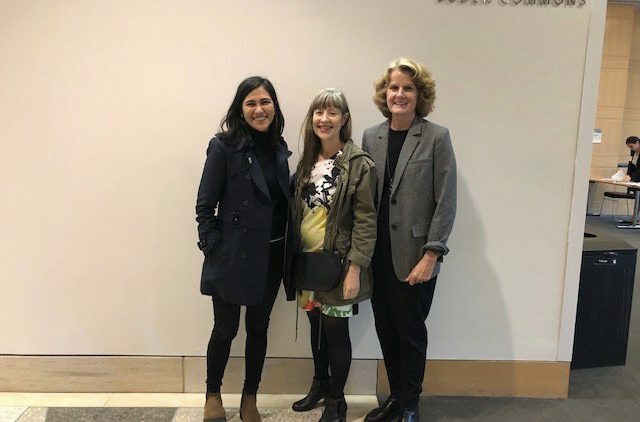 Vance Center Environment Program Director Susan Kath spoke on a panel on environmental human rights defenders at the Fordham Law Women’s Symposium: Public Policy and Gender Impact. Tracy Mann from Climate Wise Women and Luciana Tellez Chavez from Human Rights Watch also participated. Kath led a recent pro bono project for Global Witness investigating the prosecution of environmental law defenders in Brazil, Colombia, and Peru. Vance Center Executive Director Alexander Papachristou spoke at the annual meeting of the Organized Crime and Corruption Project partner network, attended by more than 100 investigative journalists from 40 media outlets around the world. His remarks focused on practical steps to reduce the risks of defamation litigation facing journalists.